Roland Kuit's "Soundlab II" is stunning! Another amazing offering from Roland Kuit. Roland has probably taught me more about sound synthesis than just about anybody! Back in the day, I used to spend hours deciphering the patches he made for the original Nord Modular synth. Years later, and not much has changed. Roland has been sharpening his genius programming skills and is now offering a mind-blowing package of innumerable patches that open for listening with a single click in the included Nord Modular demo software. I've been slowly working my way through these beautiful aural constructs and am enthralled again as I was a decade ago, inspired to create fabulous monstrosities of my own! 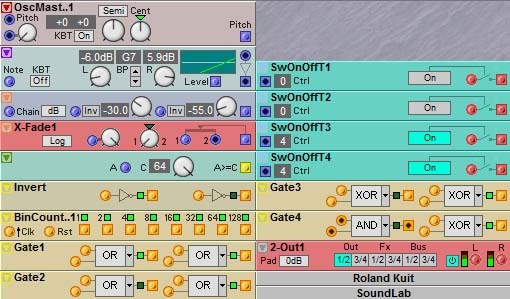 Equal parts tutorial, demonstration and resource, Roland's Soundlab II is a fantastic project. My Universe is a sentient thing. (Though, not by any definition, a deity). It just is what it is, something like a "mind", though this mind is beyond ours, contains ours and is contained by ours in a fractal embedding/repetition. So-called "religious experiences" of universal oneness or equivalence (or even more mundane epiphanies) are merely junctures when these fractal curls of Mind momentarily align and the illusory mind/self we cling to is temporarily eclipsed.